These Jelly Bean tomatoes shine ruby red and burst with irresistibly sweet flavor! 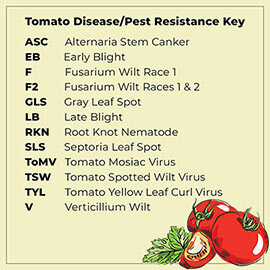 So-called not only for their sweetness, but for their petite size, this tomato's disease-resistant vines will bear multiple clusters of 15-30 grape-sized fruits. 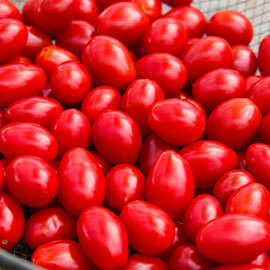 They're ideal for snacking on plain or with your favorite dip, for adding to salads, or for chopping up into salsa. They grow best in humus-enriched, well-drained soil in full sunlight. Resistant to Verticillium Wilt and Fusarium Wilt Race I. Prune the vines by cutting out the auxiliary stems between the stems and the leaves, which will help the plant produce larger fruit that ripens earlier since it's able to get more sunlight. Indeterminate. 66 days to maturity. Depth: Seeds 1/4 inch deep. Days to Maturity: 66 days from transplant. Fruit: Multiple clusters of 15 - 30 grape-sized fruits. Soil Preference: Well-drained, humus enriched soil.